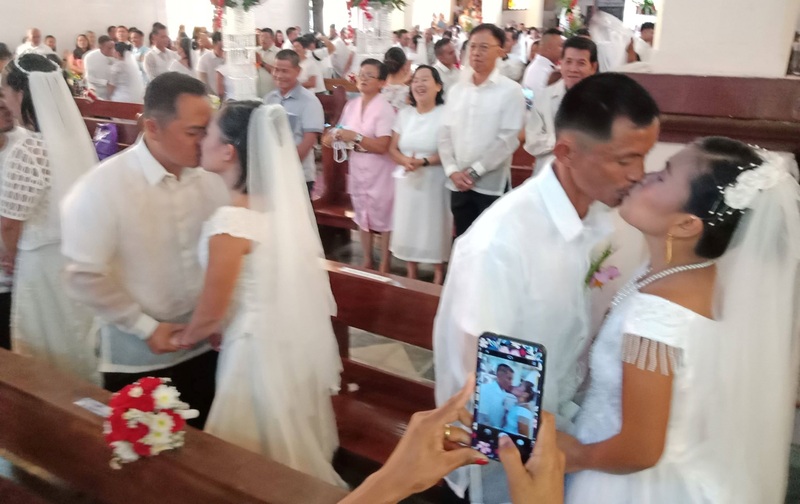 A total of 39 couples exchanged vows in a mass wedding offered by a local political coalition in Balilihan on Saturday last week. Unlike other local government unit-initiated mass civil weddings, the wedding in Balilihan was made through a Catholic ceremony at the Our Lady of Mount Carmel Parish. According to mayoral candidate Joemar Unabia, they paid for the couples’ clothes, wedding rings, and food at the reception which was held at the municipal gym. “Bisa’g piso wala to silay gasto,” said Unabia. The newlyweds following the ceremonies expressed gratitude to Unabia and the event’s sponsors. Unabia noted that some of the couples wed on Saturday have been together for 15 to 25 years. “Naningkamot ta na ma-blessingan pod ilang pagpuyo. Daghan na. Naa gani’y uban na 25 years ga-ipon sila…ato ning ipadayon puhon kung dunay interesado,” he added.